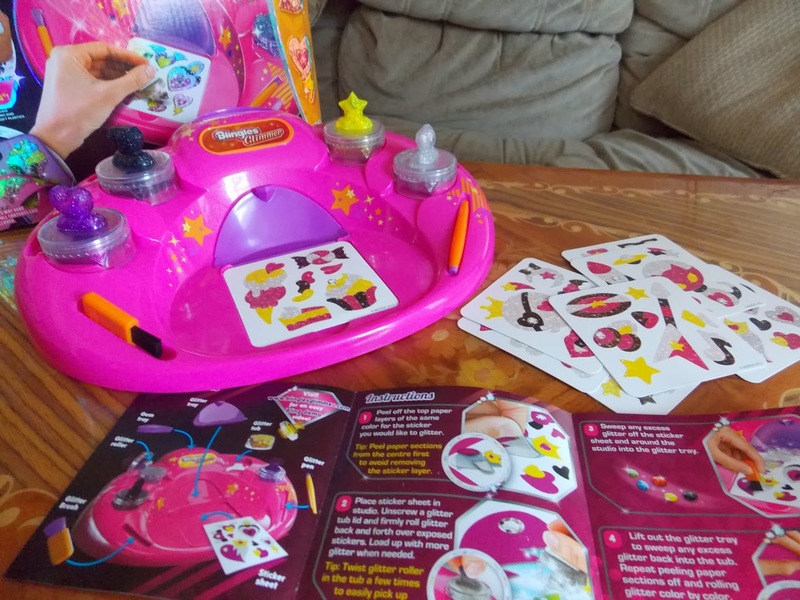 Last year we reviewed the very popular Blingles Bling Studio - and it was a huge hit with Chloe and all her school friends. When I heard about the new products in the Blingles range - Glimmer Glam Stickers I knew Chloe would enjoy reviewing it. Blingles allows you to get creative and add a touch of bling to almost anything. 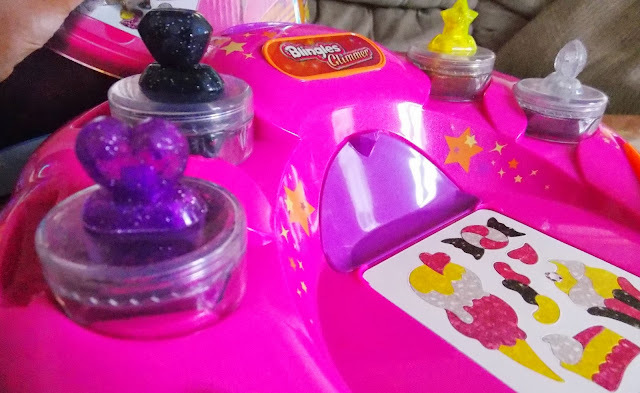 The original Blingles Bling Studio incorporated little gems to add a touch of colour to your items, the new Glimmer studio allows you to use Glitter to add sparkle! The studio base to help you create you designs and store everything neatly together. 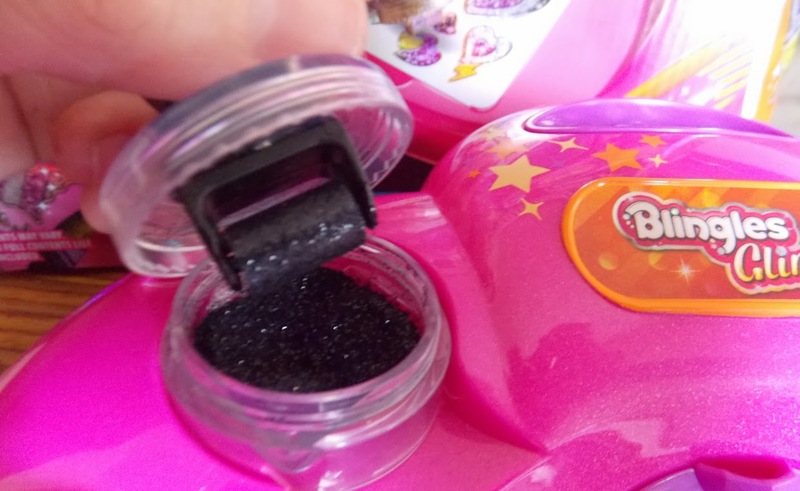 It is very simple to use Blingles Glimmer Glam studio, the glitter pots have a roller in the lid, which you simply use to roll over the stickers, leaving the glitter in place. 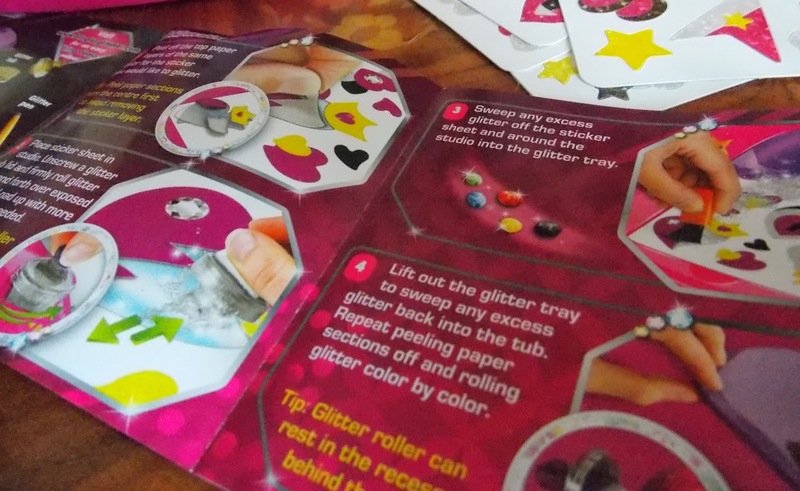 Although glitter is notoriously a messy item to allow children loose with, the Blingles Glimmer studio minimises the mess. The rollers don't always pick up lots of glitter and put it in the correct place on the sticker design sheet, but using the brush means you can easily get a great effect and make sure the glitter is where you want it to be. The stickers peel off the sheet easily and Chloe had no trouble doing it alone with no help from me. There are plenty of designs to pick from included in this set, which have lasted a long time (we haven't used up all our stickers yet - not even half!) and so you don't instantly need to think about purchasing refills which is nice. Although their are only 4 colours to choose from in this kit you can mix up the designs and use your own colours to personalise the stickers however you like. The stickers themselves stick to any flat surface, we tried them on mobile phones, laptops and paperback note books and they stuck very well to each item. The glitter, once stuck, does not appear to come off the sticker and so far has stayed in place well meaning the stickers look very glittery for a long time which is great. Here is Chloe taking a first look at the Glimmer Glam studio and showing how easy it is to make a shinny sticker. We really love the Blingles Glimmer Studio and think it is good value at around £19.99 it would make a great Christmas present, allowing girls to add a personal touch to their electronic devices, books and stationary. I saw this on the TV the other day and I thought it looked fab!